LAKOS Centrifugal Separators | Fischer Equipment Ltd. Strategically placed flow HydroBoosters prevent solids accumulation in the basin and attack conditions that breed harmful bacteria. 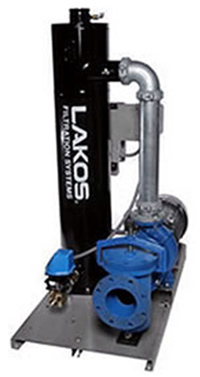 This standard flow activity plus LAKOS HydroBoosters equals effective tower cleaning. A control system mounted in a NEMA 4X, UL listed control box all packaged on a unitized skid mounting system.